Should Wealthy Christians Feel Guilty For Having Money? 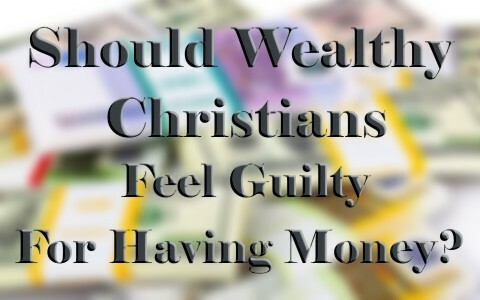 Should Christians have any guilt for having money or being rich? Is it people having lots of money or does money have lots of people? We can have possessions but the tricky part is that they can have us. Do we own them or do they own us? You see my point, hopefully. Jesus half-brother, James wrote a scathing rebuke of the rich by saying, “Come now, you rich, weep and howl for the miseries that are coming upon you. Your riches have rotted and your garments are moth-eaten. Your gold and silver have corroded, and their corrosion will be evidence against you and will eat your flesh like fire. You have laid up treasure in the last days” (James 5:1-3). When someone is exposed to the Word of God, Jesus cautions that “the cares of the world and the deceitfulness of riches and the desires for other things enter in and choke the word, and it proves unfruitful” (Mark 4:19) but does that mean being rich is a sin? It can lead to sin but that doesn’t mean being rich is sin even though wealth carries with it the risk where “the rich man [will] fade away in the midst of his pursuits” (James 1:11). Jesus told us where to store up our treasures and it’s not in storage facilities. He said “Do not lay up for yourselves treasures on earth, where moth and rust destroy and where thieves break in and steal” but rather “lay up for yourselves treasures in heaven, where neither moth nor rust destroys and where thieves do not break in and steal” (Matt 6:19-20). Down here our treasures can be lost in a stock market crash, an under-insured house fire or auto accident, a lawsuit, a cancer diagnosis or any other number of things that can hit us out of nowhere, however if we forward our treasures to heaven, then they are as safe from anything happening to them. There’s no corruption of possessions and no thief to steal them in heaven. Jesus told a parable about how useless it is to store up treasures here on earth. Jesus spoke of a certain rich man who had a lot of land and an overabundance of crops (Luke 12:16-18) so he thought he’d just build bigger storage facilities and say to himself “you have ample goods laid up for many years; relax, eat, drink, be merry” (Luke 12:19) but tragically, someone else got possession of it all because “God said to him, ‘Fool! This night your soul is required of you, and the things you have prepared, whose will they be?’ So is the one who lays up treasure for himself and is not rich toward God” (Luke 12:20-21). What good was all that wealth? It was all gone in an instant and even worse, right after death came his judgment (Heb 9:27). I don’t believe Christians should apologize or feel guilty for being rich. These are the members of the Body of Christ that may have the gift of giving and maybe that’s why God has blessed them with so much. If it was sin to be rich, then Abraham, Solomon, Joseph of Arimathea, and a host of others were living in sin. God calls being a lover of money a sin (1 Tim 3:3) but the Bible never says being rich is a sin. It is the pursuit or chasing after money that is clearly sin. That’s when it becomes an idol and replaces God on the throne of your life. Paul warned Timothy that “the love of money is a root of all kinds of evils. It is through this craving that some have wandered away from the faith and pierced themselves with many pangs” (1 Tim 6:10). The “love of money” is at the “root of all kinds of evil” but money is not evil, it’s not the root of all evil, and having money is not sin. Jesus said that “No servant can serve two masters, for either he will hate the one and love the other, or he will be devoted to the one and despise the other. You cannot serve God and money” (Luke 16:13) which means we have only two masters we can possibly serve; the Master or the money. We can’t possibly serve both. It is either possessions or profession. That was the problem with the religious leaders like “The Pharisees, who were lovers of money” and when they “heard all these things…they ridiculed him” (Luke 16:14). Money can really own us so easily. Remember Judas was the treasurer and no one even suspected him. Most of us don’t have to wrestle with the “problem” of having too much money or feeling guilty for having money. I believe God can trust me with what I have and won’t bless me with more until I prove to be faithful with what I have now, but if we are rich, we don’t have to feel guilty because God may have blessed us so that we can support certain ministries and missionaries in ways most of us can’t do. If we are rich, we should surely share our blessings with others because God cares deeply about how we use the talents He’s entrusted us with and how we help others with it because “Whoever oppresses a poor man insults his Maker, but he who is generous to the needy honors him” (Prov 14:31). I wouldn’t imagine you’d want to insult your Maker. Solomon reveals the cause and effect relationship of giving to the poor as he wrote “Whoever is generous to the poor lends to the LORD, and he will repay him for his deed” (Prov 19:17) but how will God repay or reward us for these deeds we do for the poor and disenfranchised? Jesus gives us the answer by saying “Come, you who are blessed by my Father, inherit the kingdom prepared for you from the foundation of the world” (Matt 25:34) because “Truly, I say to you, as you did it to one of the least of these my brothers, you did it to me” (Matt 25:40). More about money here: Is Money the Root of All Evil?